my eyelids close…..What can it be? --It is love passing by! 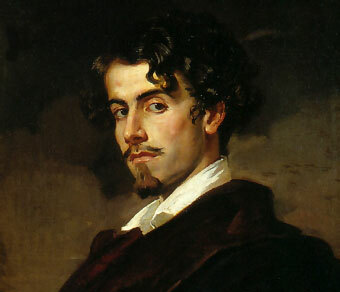 Spain’s great lyric poet, Gustavo Adolfo Bécquer (1836—1870), is famed both for his poetry and his fiction. He was born in Seville, the son of a painter. When very young he became orphaned and was reared by his grandmother, who gave him a good education. At the age of eighteen he went to Madrid to follow a career of letters. There he encountered only poverty and disease. After an unhappy marriage and an equally unhappy love affair, he died of consumption at the age of thirty-four. His poems with the symbolist overtones and a musical quality seldom equaled, have exerted influence on such modern poets as Ruben Dario and Juan Ramon Jimenez. The above poem conveys the imminence of love in cosmic terms; just to say that it refers to the natural world would be to downplay its elemental character. it communicates a seething energy; it is a dynamic evocation of love as creation. In the context of the Rhyme as a whole it presages the dawning of human love though that is no more than a fleeting anticipation here. In essence, it speaks about the transcendence of love.